THIS BLITZMETRICS, CO. (“BLITZMETRICS”) MASTER SUBSCRIPTION AGREEMENT (“AGREEMENT”) GOVERNS YOUR ACQUISITION AND USE OF OUR BLITZMETRICS, CO. SERVICES. IF YOU REGISTER FOR A FREE TRIAL FOR OUR BLITZMETRICS, CO. SERVICES, THIS AGREEMENT WILL ALSO GOVERN THAT FREE TRIAL. BY SUBSCRIBING TO ANY OF OUR SERVICES, EITHER BY REQUESTING A FREE TRIAL, BY CLICKING A BOX INDICATING YOUR ACCEPTANCE OR BY EXECUTING AN ORDER FORM THAT REFERENCES THIS AGREEMENT, YOU ACCEPT AND AGREE TO THE TERMS OF THIS AGREEMENT. IF YOU ARE ENTERING INTO THIS AGREEMENT ON BEHALF OF A COMPANY OR OTHER LEGAL ENTITY, YOU REPRESENT THAT YOU HAVE THE AUTHORITY TO BIND SUCH ENTITY AND ITS AFFILIATES TO THESE TERMS AND CONDITIONS, IN WHICH CASE THE TERMS “YOU” OR “YOUR” SHALL REFER TO SUCH ENTITY AND ITS AFFILIATES. IF YOU DO NOT HAVE SUCH AUTHORITY, OR IF YOU DO NOT AGREE WITH THESE TERMS AND CONDITIONS, YOU MUST NOT ACCEPT THIS AGREEMENT AND MAY NOT USE ANY OF BLITZMETRICS SERVICES. YOU MAY NOT ACCESS ANY OF BLITZMETRICS SERVICES IF YOU ARE OUR DIRECT COMPETITOR, EXCEPT WITH OUR PRIOR WRITTEN CONSENT. IN ADDITION, YOU MAY NOT ACCESS ANY OF BLITZMETRICS SERVICES FOR PURPOSES OF MONITORING THEIR AVAILABILITY, PERFORMANCE OF FUNCTIONALITY, OR FOR ANY OTHER BENCHMARKING OR COMPETITIVE PURPOSES. NO PROMISES, TERMS, CONDITIONS, OR OBLIGATIONS OTHER THAN THOSE CONTAINED AND THERE AND THERE IN SHALL BE VALID OR BINDING. ANY PRIOR AGREEMENTS, STATEMENTS, STATEMENT, PROMISE, EITHER ORAL OR WRITTEN, MADE BY ANY PARTY OR AGENTS OF ANY PARTY THAT ARE NOT CONTAINED IN THIS AGREEMENT ARE OF NO FORCE OR EFFECT. THIS AGREEMENT OR ANY PART OR SECTION OF IT CAN BE MODIFIED AND/OR AMENDED ONLY BY BLITZMETRICS, OR BY PRIOR MUTUAL CONSENT IF IT’S IN WRITING. BY REQUESTING ANY OF OUR SERVICES, YOU REPRESENT TO HAVE READ AND AGREED TO SUCH TERMS. THE TERMS OF THIS AGREEMENT SHALL PREVAIL OVER ANY OTHER AGREEMENT UNLESS THE SUBSEQUENT AGREEMENT SPECIFICALLY REFERENCES THIS AGREEMENT BY NAME AND SECTIONS TO BE MODIFIED. THIS AGREEMENT WAS LAS T UPDATED ON JUNE 18, 2013. IT IS EFFECTIVE BETWEEN YOU AND US AS OF THE DATE YOU ACCEPT THIS AGREEMENT AND/OR PLACE A REQUEST FOR ANY OF OUR SERVICES. “Acceptance Period” means the number of business days in which the Client must inspect, test and evaluate material deliverables to determine whether it satisfies the Specifications set forth in the SOW. “Agency” means, if applicable, any business organization providing advertising or other creative, marketing, strategy, or branding services to Client in connection with Client’s use of the Platform. “Agency Named User” means, if applicable, an employee of an Agency who is designated by an Authorized Administrator as having the right to access and use the Platform. “Authorized Administrator(s)” means an individual designated by BlitzMetrics following approval from Client’s authorized representative as having administrative access rights to the Platform. “BlitzMetrics Materials” means the Platform and all other software, routines, software designs, generic functions, user-interface conventions, interfaces to third party products, user-interface design patterns and other development or design tools which are not Client Materials, and the Documentation (and all enhancements and derivatives thereto) which are delivered or made available to Client under this Agreement. “Client Materials” means and includes all trademarks, service marks and logos associated with Client’s products and all services, data, reports, statistics and information or creative content of any kind furnished or made available directly or indirectly to BlitzMetrics by or on behalf of Client, or processed via the Platform or in connection with services provided to Client pursuant to this Agreement, including information entered into the Platform by or on behalf of Client and all data, reports, statistics and other information derived from the foregoing. “Client Named User” means an employee or contractor of Client who is designated by an Authorized Administrator following approval from Client’s authorized representative as having the right to access and use the Platform. “Confidential Information” means any and all non-public, confidential or proprietary business or technical information and know-how of the disclosing Party, including without limitation, information that is not generally known to the public and that derives value from not being generally known, whether such information is disclosed to or acquired by the receiving Party orally or in writing; including without limitation, any confidential information concerning the other Party’s business, finances, plans, customers, technology and products, and any software, documentation, algorithm, device, compilation of information, method, technique or process. The Parties expressly acknowledge that this Agreement, all Client Materials, all Personal Information, the Platform (in both Source Code and object code versions) and all Documentation provided to Client hereunder constitute Confidential Information. “Developer” means the person concerned with all facets of the software development process. Their work includes, but it’s not limited to, researching, designing, implementing, taking part in design, computer programming and software project management. “Documentation” means any written specifications, user documentation, training materials, validation test plans and other documents relating to the Platform that BlitzMetrics provides to Client. “Error” means any malfunction or failure of the Platform to conform to its Documentation in any material respect. “Error Correction” means either a modification or addition that, when made or added to the Platform, brings the Platform into conformity with its Documentation in all material respects or a procedure or routine that, when observed in the regular operation of the Platform, avoids the practical adverse effect of such nonconformity. “Indexed Content” means information, including but not limited to links, posts, and excerpts, that has been made publicly available and obtained by Us or on Our behalf from the Internet, and data derived there from, including but not limited to reports, summaries, graphs and charts. “Information Architecture” means the structural design of an information space in a manner which facilitates a functional overview, user experience and intuitive access to content. “New Product” means a product related to the Platform which contains business logic not offered or contained in the then-current version of the Platform, and it’s offered by BlitzMetrics as a separate option or feature and is priced separately. New Products are not included in the License and Maintenance Fees and are subject to a separate charge. “Personal Information” means all information obtained, stored or accessed through the Platform that identifies or can be used to identify an individual, including, without limitation: (i) full name; (ii) mailing address; (iii) telephone or fax number; (iv) email address; (v) government identification numbers, including, but not limited to an individual’s social security number, passport identification number, military identification number, voter identification number, driver’s license number or taxpayer identification number; (vi) credit card numbers or bank account information with or without any code or password that would permit access to the account. The Personal Information set forth in clauses (v) and (vi) above shall be considered “Sensitive Personal Information”. “Platform” means the computer programs and data in machine-readable form provided by BlitzMetrics to Client hereunder, together with any Error Corrections or Updates thereto furnished and hosted by BlitzMetrics in connection with Maintenance and Support Services or otherwise. “Source Code” means the human readable form of the Platform, including written comments and programmer documentation, flow charts, logic diagrams, pseudo code, notations or other supporting writings, regardless of the media on which it is stored, and intended for translation into an executable or intermediate form, or is intended for direct execution through interpretation. “SOW” means the Statement of Work or similar document detailing the services to be performed by BlitzMetrics and accepted by Client. “Update” means any modification or addition to the Platform that changes its utility, efficiency, functional capability, or application, but that does not constitute an Error Correction or a New Product. “User Documentation” means Our training, help, how-to and explanatory materials that assist Users in using the BlitzMetrics Services, as such materials may be updated from time to time. You acknowledge that You have had the opportunity to review the User Documentation during the free trial described in Section 2 (Free Trial) below. “Users” means individuals who are authorized by You to use the BlitzMetrics Services, for whom subscriptions to a BlitzMetrics Service have been ordered, and who have been supplied user identifications and passwords by You (or by Us at Your request). Users may include but are not limited to Your employees, consultants, contractors and agents, and third parties with which You transact business. “Your Data” means any electronic data, content or information that has not been made publicly available and is submitted by or on behalf of You to the Purchased BlitzMetrics Services, or is collected by You, or on Your behalf, through the BlitzMetrics Services. BlitzMetrics agrees to provide development, maintenance and support and advertising services as set forth in the attached SOW and/or Insertion Order and subject to these terms and conditions. Client is responsible for the following in connection with the Services: design, creation, and upload to BlitzMetrics’ project management system of assets (e.g., content, images, logos, and Client’s other required style guide elements); Client must provide BlitzMetrics Consultants access to its Facebook fan pages to pull data into the Social Media Command Center. Client must appoint a Primary Client Contact for BlitzMetrics who will serve as the primary point of contact for the BlitzMetrics Consultants and is responsible for coordinating logistics on the Client side including communicating Client approvals and major customer concerns. Such Primary Client Contact shall initially be [name from first page] and may be changed by Client at any time. If Client’s social campaign goal is external to Facebook (e.g., ecommerce sales, website registrations, etc. ), Client is responsible for tracking campaign success metrics on external source and must provide reporting of such tracking to BlitzMetrics for the purposes of campaign optimization. (a)	Delivery. BlitzMetrics shall complete all project deliverables as and when specified in the SOW. Client acknowledges and agrees that BlitzMetrics’ ability to meet any and all schedules is dependent in part upon Client’s prompt performance of its obligations to provide materials and written approvals and/or instructions pursuant to the SOW. Client further acknowledges that any material delays in Client’s performance or material changes requested by Client to the initial SOW may delay delivery of the Deliverables and that any such delay caused by Client shall not constitute a breach of any term, condition or BlitzMetrics’ obligations under this Agreement; and BlitzMetrics reserves the right to adjust the schedule in the event that the Client fails to materially meet agreed deadlines for delivery of information, submission of materials or granting approvals and to allow for changes in the scope or complexity of services from those contemplated by this Agreement, and as set forth in the initial SOW. Any additional costs incurred by *Developer as a result of such delays shall be agreed upon with the Client in advance. (b) Acceptance. Client shall have a period of ten (10) business days within which to inspect, test and evaluate material deliverables to determine whether it satisfies the Specifications set forth in the SOW (the **“Acceptance Period”) and to notify BlitzMetrics in writing of its acceptance or rejection based on its test results with respect thereto. If Client has not given notice of rejection within the Acceptance Period, the deliverable will be deemed to be accepted. If Client requests that BlitzMetrics correct errors in the deliverable, BlitzMetrics shall within seven (7) days of such notice, or such longer period as Client may allow, submit at no additional charge a revised deliverable in which such errors have been corrected. Upon receipt of the corrected deliverable, Client shall have an additional ten (10) business days to test the Deliverable and either (i) accept it; or (ii) request that BlitzMetrics make further corrections to the Deliverable to meet the Specifications. In the event Client determines, that the a Deliverable continues to include errors after three (3) attempts at correction by BlitzMetrics, Client may terminate this Agreement and shall be entitled to a full refund of that portion of the fees paid to BlitzMetrics hereunder in connection with that Deliverable. Client agrees to act in good faith in evaluating the Deliverables. In the event that Client tenders a rejection for a deliverable that reasonably conforms to the SOW as determined by BlitzMetrics in good faith, any work required to “cure” the nonconformity will be billed at BlitzMetrics’ then current rates. We may make one or more BlitzMetrics services available to Client on a trial basis (“Trial BlitzMetrics Services”) free of charge until the earlier of (i) the end of the free trial period of which you registered or are registering to use the applicable Trial BlitzMetrics Service or (ii) the start date of any Purchased BlitzMetrics Services ordered by client. Additional trial terms and conditions may appear on the trial registration web page or other trial registration document entered into by Client. Any such additional terms and conditions are incorporated into this Agreement by reference and are legally binding. IF YOU ELECT TO USE THE BLITZMETRICS SERVICES FOR THE TRIAL PERIOD AND DO NOT PURCHASE A SUBSCRIPTION BEFORE THE END OF THE TRIAL PERIOD, YOUR TRIAL SUBSCRIPTION FOR THE BLITZMETRICS SERVICES WILL EXPIRE AT THE END OF THE TRIAL PERIOD AND SHALL NOT AUTO-RENEW. ANY DATA ENTERED INTO THE BLITZMETRICS SERVICES BY YOU OR RECEIVED BY YOU IN CONNECTION WITH YOUR USE OF THE BLITZMETRICS SERVICES, AND ANY CUSTOMIZATIONS THAT MAYBE MADE TO THE BLITZMETRICS SERVICES BY YOU DURING THE FREE TRIAL PERIOD, WILL BE PERMANENTLY LOST UNLESS YOU PURCHASE A SUBSCRIPTION TO THE SAME BLITZMETRICS SERVICES AS THOSE COVERED BY THE TRIAL BEFORE THE END OF THE TRIAL PERIOD. NOTWITHSTANDING SECTION 10 (REPRESENTATIONS AND LIMITED WARRANTIES; REMEDIES), DURING THE FREE TRIAL PERIOD THE BLITZMETRICS SERVICES ARE PROVIDED “AS-IS” WITHOUT ANY WARRANTY OR SUPPORT. Client must review the User Documentation during the Trial Period so that Client becomes familiar with the features and functions of the BlitzMetrics Services before Client makes his/her purchase. (a)	Training. BlitzMetrics will provide to Client at least one (1) 60-minute training session in the manner to be determined by Client regarding the features, functionality, and basic usage of the Platform. In addition to the foregoing training session, BlitzMetrics will provide to Client the user manual/guide and/or any other Documentation promptly upon the reasonable request of Client. (b)	Maintenance and Hosting. BlitzMetrics will providence maintenance and hosting as set forth in the SOW and subject to BlitzMetrics’ and/or third-party provider’s standard hosting services terms and conditions and/or statement of use where applicable. (a)	License. Unless expressly stated otherwise in a Statement of Work, BlitzMetrics will retain all right, title and interest in and to all deliverables, work product, designs, developments and information contained in the BlitzMetrics Materials resulting from, including any and all intellectual, property rights therein (collectively, “Work Product”). BlitzMetrics hereby grants to Client a non-exclusive, non-transferable, worldwide license during the Agreement Term to access and use the Platform through the host environment (and any of BlitzMetrics’ intellectual property included therein) for the benefit of Client’s business purposes, subject only to such restrictions as are specifically set forth herein. Client shall be fully responsible for the acts or omissions of any Client Named Users and any Agency Named Users gaining access to the Platform pursuant to the foregoing license grant. Notwithstanding the foregoing, BlitzMetrics shall have no obligation to provide any New Products as part of the license granted hereunder or in respect of the License and Maintenance Fees set forth in this Agreement; provided, however, that BlitzMetrics shall remain obligated in accordance with the terms hereof to provide Error Corrections or Updates, as necessary, during the Agreement Term. (b)	Retention of Rights to IP. Except as otherwise set forth herein, BlitzMetrics retains all right, title and interest in and to the BlitzMetrics Materials, in all forms, and all copies and modifications of the same, including all worldwide rights to patents, copyrights, trademarks or trade secrets in or relating to the same. Client is not acquiring any right, title or interest of any nature whatsoever in any BlitzMetrics Materials except the license rights affirmatively stated herein. Client retains all right, title and interest in and to the Client Materials in all forms, and all copies and modifications of the same, including all worldwide rights to copyrights, trademarks or trade secrets in or relating to the same. BlitzMetrics is not acquiring any right, title or interest of any nature whatsoever in any Client Materials except to use them to the extent necessary in connection with the provision of any of the Maintenance and Support Services provided hereunder. Each Party agrees that it will not, directly or indirectly, question or contest the validity of the other Party’s ownership interests as set forth herein. (c)	License Restrictions. Client will not, and will not knowingly permit any Agency or any Third Party to, make any use of or disclose the Platform or any Documentation that is not expressly permitted under this Agreement. Without limitation of the foregoing, Client will not knowingly (and will not knowingly permit any Agency or any Third Party to) (i) reverse engineer, decompile, disassemble, or otherwise attempt to discern the Source Code or interface protocols of the Platform; provided, however, that this Agreement contemplates that Client or an Agency may customize the Platform without making changes to the Source Code, (ii) modify or adapt the Platform or any Documentation except as otherwise described herein, (iii) make any copies of the Platform or Documentation except as expressly set forth herein, (iv) resell, distribute, or sublicense the Platform or Documentation, make the Platform or Documentation available on a “service bureau” or time-sharing basis, or otherwise allow any unauthorized Third Party to use or access the Platform or the Documentation, (v) remove or modify any proprietary marking or restrictive legends placed on the Platform or the Documentation, (vi) disclose, provide, or otherwise make available any trade secret contained within the Platform or the Documentation, or (vii) use the Platform or the Documentation in violation of any applicable law or regulation. (d)	Access to the Platform; System Requirements. Promptly but in no event later than one (1) day following the Effective Date, BlitzMetrics will deliver to Client log-in IDs and passwords for each Authorized Administrator. The Authorized Administrators are permitted to grant access to the Platform by Client Named Users and Agency Named Users. Client is responsible for denying access to any Client Named User or any Agency Named User, respectively, upon any such user’s termination of employment with Client or an Agency, as may be applicable. Client and Agency are responsible for providing their own access to the internet and for insuring that the computers or other hardware used to access the Platform are equipped with one of the following programs necessary to access the Platform: (i) Internet Explorer 7.0+, (ii) Firefox 2.0+, or (iii) Safari 3.0+. (the “Minimum System Requirements”). (a)	Service Fees. Client agrees to pay for the services as set forth in the corresponding service Order and as specified in our Billing Policy. (a)	Limitations on Disclosure and Use of Confidential Information. Each Party, as the recipient of Confidential Information from the other Party, agrees that it will not disclose, provide or otherwise make available any Confidential Information of the disclosing Party, without the disclosing Party’s prior written consent. In addition, each recipient Party agrees that it will not: (i) use the disclosing Party’s Confidential Information for any purpose beyond the scope of this Agreement; (ii) copy any part of such Confidential Information or disclose any part of such Confidential Information to any person other than the recipient’s employees, representatives or agents, and to its legal, technical and financial consultants, in each case on a confidential basis in the ordinary course of its business, as applicable, who need the information to perform their duties and who are bound by confidentiality obligations; (iii) authorize or permit any such individual to use or disclose any part of such Confidential Information in violation of this Agreement; or (iv) produce any product nor offer any service of any nature whatsoever based in whole or in part on such Confidential Information, nor cause or assist any other person to do so. (b)	Exclusions. The recipient Party’s obligations under this Agreement will not apply to any portion of the disclosing Party’s Confidential Information that: (i) at the time of disclosure to recipient, was in the public domain or subsequently becomes a part of the public domain through no breach of this Agreement or fault of the recipient; (ii) recipient had in its possession at the time of disclosure by the disclosing Party, as established by written documentation in existence at that time, and that was not acquired directly or indirectly from the disclosing Party or with knowledge of confidentiality restrictions; or (iii) recipient subsequently acquires by lawful means from a Third Party who is under no obligation of confidentiality or non use owed to disclosing Party; or (iv) is independently developed by the recipient Party without reference to the Confidential Information. (c)	Disclosure Pursuant to Legal Process. If the recipient Party is legally compelled to disclose any portion of the disclosing Party’s Confidential Information in connection with a lawsuit or similar proceeding or to any governmental agency, the recipient will, to the extent permitted, give the disclosing Party prompt notice of that fact, including in its notice the legal basis for the required disclosure and the nature of the Confidential Information that must be disclosed. The recipient Party will reasonably cooperate with the disclosing Party in its efforts to obtain a protective order or other appropriate protection relating to the disclosure and subsequent use of such Confidential Information. The recipient Party will disclose only that portion of the disclosing Party’s Confidential Information that it is advised by counsel is legally required to be disclosed. If the recipient Party is legally compelled to disclose any portion of the disclosing Party’s Confidential Information in connection with a lawsuit or similar proceeding or to any governmental agency, the recipient will, to the extent permitted, give the disclosing Party prompt notice of that fact, including in its notice the legal basis for the required disclosure and the nature of the Confidential Information that must be disclosed. The recipient Party will reasonably cooperate with the disclosing Party in its efforts to obtain a protective order or other appropriate protection relating to the disclosure and subsequent use of such Confidential Information, provided that disclosing party reimburse Recipient for any costs, expenses, fees or time incurred in connection with such cooperation. The recipient Party will disclose only that portion of the disclosing Party’s Confidential Information that it is advised by counsel is legally required to be disclosed. (d)	Enforcement. The recipient Party acknowledges that the disclosing Party would have no adequate remedy at law should recipient breach its obligations under Section 6.1 through 6.3 and agrees that, in addition to any other remedies that may be available to it at law or equity, the disclosing Party will be entitled to enforce its rights there under by obtaining appropriate equitable relief, including, without limitation, a temporary restraining order and an injunction without the necessity of posting a bond. (f)	Return of Confidential Information. Upon request by the disclosing Party, the recipient Party will return any portion of the disclosing Party’s Confidential Information that recipient no longer has the right to use, including all copies of that Confidential Information, in any medium, or, if so directed by the disclosing Party in writing, the recipient will destroy all copies of that Confidential Information (except for archival copies that may be required for compliance purposes or as directed by counsel). (g)	Standard of Care. The recipient Party agrees to employ with regard to the Confidential Information procedures that are no less restrictive than the procedures used by it to protect its own confidential and proprietary information of similar sensitivity (and that in no event are less restrictive than commercially reasonable procedures). Each Party shall also notify the other Party promptly in writing in the event such Party learns of any unauthorized use or disclosure of any Confidential Information that it has received from the other Party, and will cooperate in good faith to remedy such occurrence. (h)	Security of Personal Information. BlitzMetrics will maintain commercially reasonable security procedures and practices appropriate to protect any Personal Information obtained in the course of completing its obligations under this Agreement, will not use or disclose such information except to the extent necessary to perform any services hereunder and shall comply with all applicable privacy laws, rules and regulations with respect thereto. (i)	Security. BlitzMetrics will protect the confidentiality, integrity and security of the Platform and all information stored or contained therein or transmitted thereby from any unauthorized use, access, interruption or modification by any Third Parties. BlitzMetrics will immediately notify Client if it has knowledge that any unsolicited data or messages are being sent to Client’s subscribers or if there is a security breach with respect to the Platform, including any Personal Information contained therein. BlitzMetrics agrees to use commercially reasonable efforts to cooperate with Client to prevent and/or rectify any of the foregoing. (a)	Mutual Representations and Warranties. Each Party represents and warrants that as of the Effective Date and at all times thereafter: (a) this Agreement constitutes its valid and binding obligation and is enforceable against it in accordance with the terms of this Agreement; and (b) the execution and delivery of this Agreement by it and the performance of its obligations hereunder: (i) are not in violation or breach of, and will not conflict with or constitute a default under, any material contract, agreement or commitment binding upon it; and (ii) will not conflict with or violate in any material manner, any applicable law, rule, regulation, judgment, order or decree of any government, governmental instrumentality or court having jurisdiction over such Party. (b)	Warranties by Client with respect to Sensitive Personal Information. Client, as of the Effective Date and at all times thereafter, hereby represents and warrants to BlitzMetrics that it will not access or use the Platform to collect, store, or process Sensitive Personal Information for any purpose whatsoever. Client agrees that should any unsolicited Sensitive Personal Information be collected by the Platform, Client will notify BlitzMetrics promptly. (i)	Material Conformity. The Platform, as delivered under this Agreement, will conform in all material respects to the Documentation for the current version of the Platform, provided that (i) all software which is not part of the Platform, all firmware, and all hardware products are operating in accordance with their respective specifications, and (ii) Client is using the Platform in conjunction with the Minimum System Requirements and in compliance with all instructions included in the Documentation and in accordance with all live training provided by BlitzMetrics. (ii) No Destructive Elements. The Platform, when accessed and used by Client, will not contain any viruses, worms, bombs, Trojan horses, malicious code or instruction or other computer software routines designed to access, modify, delete, damage, detrimentally interfere with, surreptitiously intercept, expropriate, or destroy software, hardware, Personal Information, or data (“Destructive Elements”), other than any time lock or similar mechanism that BlitzMetrics may include in the Platform to deactivate the Platform upon termination or expiration of the Agreement or the license provided hereunder. (iii)	Development/Modifications. Any custom modification to or alteration of the Platform performed by BlitzMetrics at the request of Client in accordance with this Agreement will conform to industry development standards, including the development of appropriate Documentation and training materials, as required. (iv)	Services. All services to be performed by BlitzMetrics under this Agreement, including any Maintenance Services and Training Services, will be performed in a professional and workmanlike manner in conformance with industry standards by individuals of appropriate training and experience and in providing such services shall comply with all applicable laws, rules and regulations. (v)	Ownership. BlitzMetrics owns the Platform and the Documentation and has the full power and authority to grant to Client the license rights herein granted without the consent of any other person, and the Platform and the Documentation do not violate any applicable laws, rules or regulations, including, without limitation, applicable laws regarding privacy and security. The Platform and the Documentation do not infringe, violate or otherwise misappropriate the intellectual property or other proprietary rights of any Third Party. (vi)	Limited Warranties Not Applicable. Client will not have any rights with respect to any warranty specified in Section 9(c) and such warranty will be deemed not to apply to Client, to the extent that the failure of the Platform to conform to the Documentation or to otherwise meet such warranty was caused by or results from any defect, malfunction or delay caused by Facebook’s and/or Client’s systems and software; provided, however, that there is no gross negligence or willful misconduct on the part of BlitzMetrics in such case. (d)	Remedies for Breach of Platform Warranties. If any of the warranties specified in Section 9(c) are breached, then the following terms will apply: (i) Client will promptly notify BlitzMetrics of the breach and any associated details reasonably requested by BlitzMetrics in its attempt to remedy the problem. 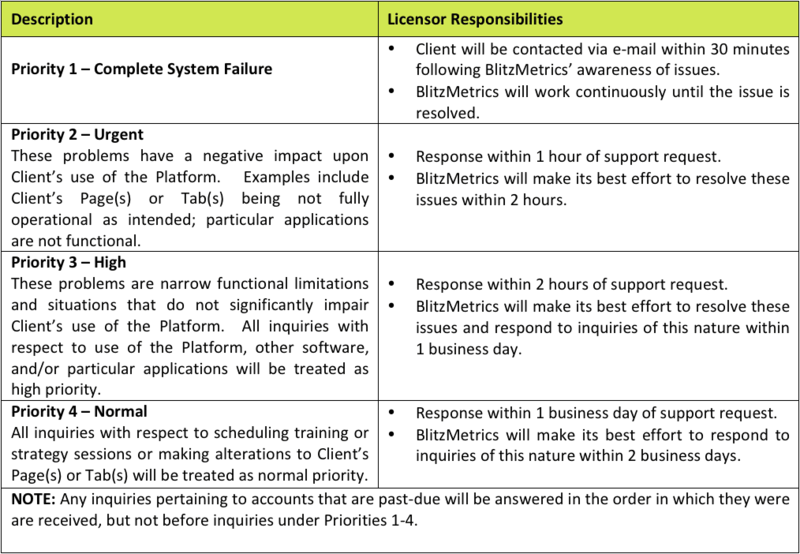 Client will cooperate with BlitzMetrics in attempting to re-create the conditions that existed at the time the Platform failed, if reasonably requested by BlitzMetrics, (ii) BlitzMetrics will diligently and in good faith attempt to correct the reported defect by repairing or modifying the Platform within a commercially reasonable period of time, and (iii) if any defective portion of the Platform causes the entire Platform to fail in its essential purpose, and if BlitzMetrics determines that it is unable to cure that defect by repairing or modifying the Platform as provided herein, then Client may elect as its sole and exclusive remedy to (1) terminate its right to use the Platform and Documentation, (2) return all Platform and Documentation to BlitzMetrics, and (3) receive a full refund of the fees actually paid by Client, less any portion of such fees attributable to any period of time during which the Platform was in material full compliance with the warranties provided herein. (e)	Remedies for Breach of Service Warranty. If BlitzMetrics breaches its obligation to perform the services in accordance with the warranty set forth in Section 9(c), and BlitzMetrics fails to cure the breach within ten (10) days after written notice of the breach is given by Client to BlitzMetrics, Client will have the right to terminate the applicable service, in which case BlitzMetrics must refund to Client within ten (10) days of such termination a pro-rata portion of any fees pre paid by Client for the applicable period of coverage. (f)	Remedies for Breach of Ownership Warranty. If the warranty specified in Section 9(c) is breached because any part of the Platform or Documentation is deemed to infringe, violate or otherwise misappropriate a Third Party’s intellectual property or other proprietary rights, then BlitzMetrics will, in its discretion, either: (i) modify the Platform and/or Documentation so that it becomes non-infringing, while retaining as much functional equivalence as is commercially reasonable, (ii) replace such Platform and/or Documentation with a comparable non-infringing substitute containing all material functionality; (iii) obtain a license for Client to use such Platform and/or Documentation at no additional cost or obligation to Client; or (iv) refund to Client an amount equal to the fees paid with respect to such Platform and/or Documentation, less the portion of the fees attributable to the period over which Client actually used the Platform and/or Documentation. BlitzMetrics will fully indemnify and hold Client harmless from any and all costs and expenses related to any such breach. EXCEPT AS EXPRESSLY PROVIDED ELSEWHERE IN THIS AGREEMENT, ALL SERVICES PROVIDED BY BLITZMETRICS ARE PROVIDED ON AN “AS IS” “AS AVAILABLE” BASIS. BLITZMETRICS IS NOT RESPONSIBLE FOR DELAYS CAUSED BY WAR, ACT OF GOD, EMBARGO, OR ANY OTHER CIRCUMSTANCE BEYOND ITS CONTROL. EXCEPT FOR OBLIGATIONS OF INDEMNIFICATION OR CLAIMS ARISING FROM THE WILLFUL MISCONDUCT OF A PARTY AND/OR A BREACH OF SECTION 9 HEREIIN, UNDER NO CIRCUMSTANCES SHALL EITHER PARTY BE LIABLE FOR INDIRECT, INCIDENTAL, CONSEQUENTIAL, SPECIAL OR EXEMPLARY DAMAGES (EVEN IF THE PARTY HAS BEEN ADVISED OF THE POSSIBILITY OF SUCH DAMAGES), ARISING FROM ANY ASPECT OF THE RELATIONSHIP HEREUNDER. IN NO EVENT SHALL BLITZMETRIC’S TOTAL LIABILITY EXCEED THE SUMS DUE UNDER THIS AGREEMENT FOR THE SIX MONTH PERIOD IMMEDIATELY PRECEDING ANY INCIDENT GIVING RISE TO LIABILITY. CLIENT ACKNOWLEDGES THAT BLITZMETRICS HAS AGREED TO PRICING IN RELIANCE UPON THE LIMITATIONS OF LIABILITY AND THE DISCLAIMERS OF WARRANTIES AND DAMAGES SET FORTH HEREIN, AND THAT THESE CONSIDERATIONS FORM AN ESSENTIAL BASIS OF THE BARGAIN BETWEEN THE PARTIES. CLIENT AGREES THAT THE LIMITATIONS AND EXCLUSIONS OF LIABILITY AND DISCLAIMERS SPECIFIED IN THIS AGREEMENT WILL SURVIVE AND APPLY EVEN IF FOUND TO HAVE FAILED OF THEIR ESSENTIAL PURPOSE. SOME JURISDICTIONS DO NOT ALLOW THE EXCLUSION OF CERTAIN WARRANTIES OR LIABILITIES, SO SOME OF THE ABOVE EXCLUSIONS MAY NOT APPLY TO CLIENT. (b)	By BlitzMetrics. BlitzMetrics shall indemnify and hold harmless, and at Client’s option defend, Client and its affiliates, and their respective officers, directors, employees, agents, successors and assigns (collectively, the “Client Indemnified Parties”) from and against any Claims against any of the Client Indemnified Parties arising out of or relating to (i) any Claim based on BlitzMetrics’ breach of warranty or confidentiality, (ii) any Claim based on intentional misconduct of BlitzMetrics or any individual acting under its control and direction, and (iii) and any Claim by Third Parties alleging that Client’s use or implementation of BlitzMetrics’ technology, methodology, deliverables, services, or any other BlitzMetrics Materials infringes, violates or otherwise misappropriates any intellectual property or other proprietary rights of such Third Party. (c)	Conditions to Indemnity. A party seeking indemnity must provide prompt written notice to the indemnifying party of any such Claim. The indemnifying party may solely control settlements, compromises, negotiation and defenses of any such action; provided that indemnified party may participate in its defense with counsel of its choice at its own expense. The indemnified party shall provide all commercially reasonably available information, assistance and authority, to the indemnifying party at the indemnifying party’s expense. Notwithstanding the foregoing, the indemnifying party may not compromise or settle any indemnified Claim in a manner that adversely affects the indemnified party without its prior written consent, which consent will not be unreasonably withheld, conditioned or delayed. (a)	License Term. The term of Client’s license hereunder and associated services (the “Agreement Term”) begins on the Effective Date and shall continue for an initial period of one (1) year unless earlier terminated in accordance with this Agreement and may be extended by mutual agreement in writing between the Parties. (b)	Termination by BlitzMetrics. BlitzMetrics may terminate this Agreement, any license granted, or any services provided hereunder upon thirty (30) days prior written notice to Client should Client breach, in any material respect, any term of this Agreement and fail to cure that breach within fifteen (15) days after receipt of written notice thereof from BlitzMetrics. BlitzMetrics may suspend performance at any time if suspects that Client is using the services for illegal or improper purpose or if Client has failed to pay invoices as they come due. (c)	Termination by Client. Client may terminate this Agreement or any services provided hereunder or at any time during the term of this Agreement without any further liabilities to BlitzMetrics unless otherwise provided herein for its convenience, in each case, upon fifteen (15) days prior written notice to BlitzMetrics. In addition, Client may terminate this Agreement upon written notice to BlitzMetrics if: (i) BlitzMetrics breaches, in any material respect, any material obligation hereunder and fails to cure that breach within fifteen (15) days after receipt of written notice of the breach from Client. The services provided under the Agreements shall be deemed a license or lease of intellectual property and in the event that BlitzMetrics voluntarily or involuntarily becomes subject to the protection of the United States Bankruptcy Code 11 U.S.C. (the “Bankruptcy Code”), it is agreed that Client shall be entitled to all of the benefits of the Bankruptcy Code including the protections of Section 365(b) and the amendments to the Bankruptcy Code affected by the October 18, 1988 Intellectual Property Bankruptcy Protection Act. All rights and licenses, other than with respect to trademarks, granted under or pursuant to this Agreement are, and shall otherwise be deemed to be, for purposes of Section 365(n) of the Bankruptcy Code, licenses of rights to “intellectual property” as defined under Section 101 of the Bankruptcy Code. The parties agree that Client, as a licensee of such rights under this Agreement, shall retain and may fully exercise all of its rights and elections under the U.S. Bankruptcy Code. If BlitzMetrics or the trustee in bankruptcy rejects this Agreement under Section 365 of the Bankruptcy Code, Clients may elect: (a) to treat the Agreement as terminated; or (b) retain Licensee’s rights under the Agreement, specifically including the right to exercise its rights granted herein to the Assets. Failure by Client to assert its right to “retain its benefits” to the Assets, pursuant to Section 365(n)(1)(B) of the Bankruptcy Code, under an executory contract rejected by the trustee in bankruptcy shall not be construed by the courts as a termination of the transaction by BlitzMetrics under Section 365(n)(1)(A) of the Bankruptcy Code. (d)	Effect of Termination. Upon termination of this Agreement in its entirety, Client, all Client Named Users, any Agency and all Agency Named Users (if applicable), will discontinue use of the Platform and will return to BlitzMetrics all copies of BlitzMetrics Materials and will destroy any embodiments of the same stored in or on a reusable electronic or similar medium, including memory, disk packs, tapes, and other peripheral devices. BlitzMetrics will discontinue use of any Client Materials and return to Client all copies of Client Materials and will destroy any embodiments of the same stored in or on a reusable electronic or similar medium, including memory, disk packs, tapes, and other peripheral devices. Termination will not relieve Client from its obligation to pay any and all fees that accrue prior to the date of termination. Upon termination of this Agreement, Client will be responsible for (i) services provided up to the effective date of termination, and (ii) License and Maintenance Fees which accrue up to the effective date of termination. Additionally, should Client terminate additional custom services with respect to which BlitzMetrics has incurred an expense prior to termination (such as creation of personalized documentation), Client shall be responsible to reimburse BlitzMetrics for such expense. In the event that this Agreement is terminated due to a breach of Section 9(e), Client shall only be obligated to pay the License and Maintenance Fee for services provided up to the date of the notice of breach. The provisions of sections 8, 10, 11, 12, 13 and 15 of this Agreement shall survive termination. These Terms and Conditions shall be governed by and construed in accordance with the laws of the State of Colorado without reference to conflicts of laws’ provisions. Parties hereby consent to the personal jurisdiction and venue of the state and federal courts located in Boulder County, Colorado, with respect to any disputes arising hereunder, and expressly waives any defense of convenient forum. No Party will assign or otherwise transfer any of its rights or obligations under this Agreement without the prior written consent of the other Party. Notwithstanding the foregoing, any Party may, without the consent of but the prior written notice to the other Party, assign or otherwise transfer this Agreement to any of its affiliates, or in connection with a merger, consolidation, sale of stock, sale of all or substantially all assets or other change of control transaction. This Agreement is binding upon and will inure to the benefit of each Party and their respective permitted successors or assigns. (a)	Each Party is an independent contractor of the other Party and not an agent, joint venturer, or business partner of the other. This Agreement sets forth the entire agreement and understanding of the Parties relating to the subject matter herein and merges all discussions, representations, covenants, promises, discussions, negotiations, and exchanges between them with respect thereto. This Agreement is for the sole benefit of the Parties, and does not create any rights on the part of any Third Party. No modification of or amendment to this Agreement will be effective unless in writing signed by authorized representatives of both Parties. No waiver of any rights is to be charged against any Party unless such waiver is in writing signed by an authorized representative of the Party so charged. If any provision of this Agreement is held invalid or unenforceable by any court of competent jurisdiction, the other provisions of this Agreement will remain in full force and effect, and, if legally permitted, such offending provision shall be replaced with an enforceable provision that as nearly as possible effects the Parties’ intent. This Agreement may be executed in counterparts, each of which shall be considered an original, but all of which together will constitute one and the same instrument. (Fax 866-883-0729) or to Client at [Client Name], [Client Address], Attn: [Contact Person]. (c)	Nothing in this Agreement shall render either party an employee, partner, agent of, or joint venturer with the other party for any purpose, nor shall either party hold itself out as such for any purpose. This Agreement is a non-exclusive agreement, and both parties remain free to enter into similar agreements with third parties. Nothing in this Agreement, express or implied, is intended or shall be construed to confer upon any person, firm, or corporation other than the parties hereto and their respective successors or assigns, any remedy or claim under or by reason of this Agreement or any term, covenant, or condition hereof, as third party beneficiaries or otherwise, and all of the terms, covenants, and conditions hereof shall be for the sole and exclusive benefit of the parties hereto and their successors and assigns.